On Wednesday, January 16, 2019, the City of Hartsville recognized employees that hit milestone years with the City. Seventeen employees were acknowledged for a total of 270 years of service to the City of Hartsville. Of those 270 years, 105 were from only three very dedicated employees: Marlene Johnson (30 years), Marguerite Miles (35 years), and Rilla Thomas (40 years). Rebecca Mejia-Ward, Human Resources Manager, commended these employees for their service to Hartsville and its residents. She said, “It is quite unusual in today’s world to find employees that stay with an organization for as little as five years. 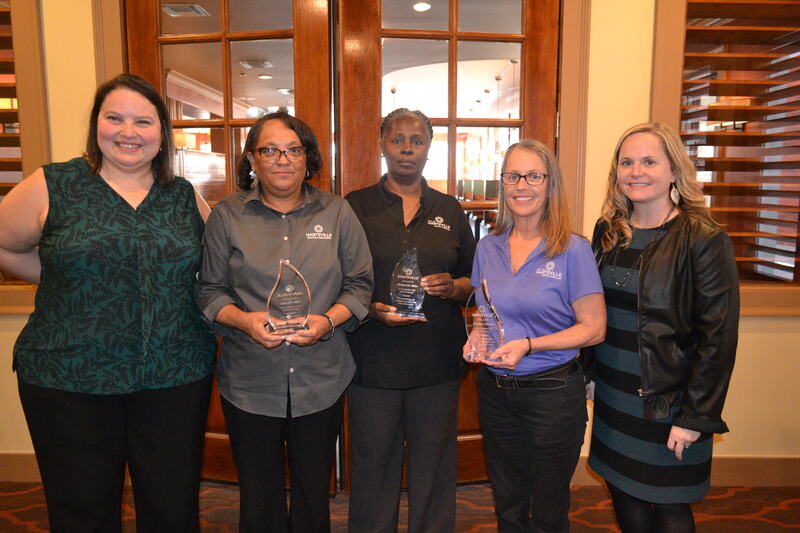 These outstanding ladies have long surpassed that milestone and deserve this recognition for their many years of commitment to the City.” The City of Hartsville is fortunate to have so many dedicated workers that report to their job each day just to serve the citizens of this City. The City of Hartsville recognized these three employees for their dedicated service to the City. These three employees together have been with the City for a total of 105 years. Pictured are, from left to right, Rebecca Mejia-Ward (Human Resource Manager), Rilla Thomas (Clerk of Court/Finance), Marguerite Miles (Finance), Marlene Johnson (Police), and Natalie Zeigler (City Manager).